1. (+) Jessica, the Protagonist - Jessica has this unassuming air which makes it easy to read her perspective. She's smart and analyzes/worries about everything. I like that she learns to be independent, even if she wasn't at first. Her perspective also shows her great character development as she realizes a fundamental lesson in life and as the title implies, learns what it takes to be a ruler of old-fashioned, blood-thirsty vampires. 2. (+) Lucius/The Romance - Lucius is just as wonderful a romantic interest as before. He's confident but not arrogant. He's incredibly mature and strong and faces death without breaking. (Though he does still have faith in his wife, but he was framed pretty badly). Also, he and Jessica seem more in love than they did by the end of the first book, which struck me as a bit weird at first but makes sense. It also was touching to see his devotion to her. I loved how the climax/scene at the end of the first book became symbolic in this book for their relationship. 3. (+/-) Murder Mystery - I obviously can't talk about this much without ruining it for you guys, but I felt that some parts of the murder mystery were terribly obvious. I'm not sure if that was the author's intention--keep one part obvious and keep a more minor part in the dark--but it took away from some of the suspense and enjoyment for me. But I like I said--there were still some things that were hidden and came as a shock at the end; that was definitely nice. 4. (--) Mindy's Perspective - I really don't like Mindy. I understand if college isn't the right thing for you after high school but I can't understand how you can fail out of community college due to your inability to concentrate thanks to a month long tryst you had with a vampire you now love but are broken up with. Long sentence of me saying that she is rather air-headed. Yes, she helps Jessica and gives her great support, which is nice... but reading her perspective... and the stereotype of it -- with Fantaskey having her say like maybe ten times per chapter in her thoughts.... It just wasn't for me. 5. (+) Raniero/Lucius's Perspective - Raniero, on the other hand, I found to be an interesting character. He is first introduced at the wedding (if you choose to read it from Fantaskey's website)... but it doesn't matter if you do because his character is developed really well in this book. He is a sort of mystery within the murder mystery, and instead of Lucius writing to his uncle, he writes to Raniero... so not only do you get to meet this complex and haunted new guy, but you also get to read about another side of Lucius and discover their history together as friends. 6. (+) Not Exclusive - No, it's not exclusive; you can still read it if you haven't read the first book. Though reading the first novel and the wedding posted on Beth Fantaskey's website would be helpful, it's not necessary. Jessica's perspective is one which tends to explain everything that has already happened; she's rather fretful like that. 7. (+) World-building - I loved reading about this other side to the Romanian vampires. They have a rather dynamic history and code of laws that both we as readers and Jessica get to figure out. They're sort of like the typical vampires--old, blood-thirsty--but they're not harmed by the sun and they're split into two ruling families (Jessica's and Lucius's). Each family also has characterizing traits... but even if the vampires aren't that unique, Fantaskey's world with this Romanian style vampire government deal is, and it was wonderful getting to read more about this since it was alluded to rather heavily in the first book. 8. (+) The Writing - Except for Mindy's perspective, which I hated, I thought the writing was done pretty well. I didn't notice any hiccups and I did like seeing how each character talked and acted differently--Fantaskey is great at really making the characters their own. 9. (+) The Pacing - Though it takes a while for the actual murder to happen, I thought the pacing was done pretty well. Beth Fantaskey's books don't separate the chapters--they are placed on the same page as the other text, and it just becomes easier to read that way. She also makes each chapter pretty short, which really helps with the pacing. 10. (+) The Cover - I like the way this cover matches the first book and its darker tone. Even though you don't see Lucius's face, I also like that babyish feel to Jessica's & the idea of the girl dancing/floating with that dress--it is very much a story about a girl being swept up into an unfamiliar world and learning to make it her own. 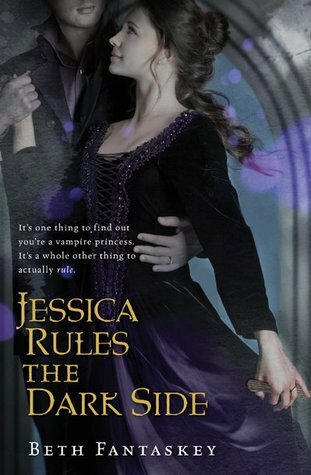 Jessica Rules the Dark Side is a sequel which doesn't quite match up to the first book but is still packed with great romance, character development, and mystery and is still a fun read for all. **Side note: I wouldn't recommend reading the wedding. It's pretty long and has little tension which made it kind of boring for me.... so unless you want all the details, I'd say you should skip it. **Also re: me not feeling that it doesn't match up to the first book -- it's mostly the murder mystery part and how I could predict things there whereas I couldn't predict what exactly would happen in the first book. The characters (minus Mindy) are just as lovable as before though. I absolutely loved Jessica's Guide for Dating on the Dark Side. I thought the author did a great job on picking up right where she left in the last book swinging to forward to this one. Everything in the book I LOVED. The characters, the plot, even the love between Jessica and her new husband Lucius, is sweet and divine!